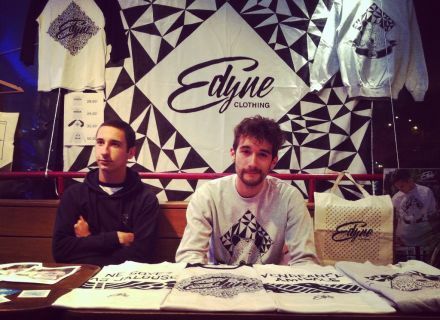 To continue in the original presents and " Made in Niort " of Christmas, we are going to speak about Edyne Clothing today. But what is it? This company was born on June 10th, 2015. It is kept by Edouard Gabet, 22-year-old Niortais and aims at the conception of T-shirts with graphs realized in the hand. · Edouard, what motivated you to create your own company of conception of T-shirts? I always wanted to make a mark of clothes. I threw it a few months ago, because I had just finished my studies of media cinema and I could dedicate myself to it completely. Actually I have designer's diploma director and what pleases me in this project it is that I mix the graphic creation and the video realization for the promotion of my products, as well as musical composition. · Explain Us the concept of your mark? Your slogan is " to make jealous the women ", why? We make menswear which the women are going to adore carrying. I had this idea because my friend often carried my T-shirts. I liked her side " bad chorus girl " which menswear brought her. We aim at creating a product which has to please as much the women as the men. · Why your company is called EDYNE, which is the origin of this name and its meaning? Edyne comes from my first name and from the first name of my friend of the time, Edouard and Capucine, Edyne (is it to him to teach more). The mixture of a male and feminine first name represents well the concept of the mark. · Having no your own shop, you open from time to time " short-lived shops ". How do you choose the place? It is the first time when we set up a short-lived shop. It took place on November 18th, 2015, street Souché, in Niort. It is within the association 99 % (who is a collective of artists) during the open doors " Enter at the artist's! " That we displayed our products. · Do you Plan to open your own shop one day? Yes, of course, to open a shop is one of our biggest objectives. Work in a place personalized just like the mark where people would feel good would be even a dream! · What are the peculiarities of your T-shirts? Where are they made and in what materials are they? We favor a single color for each of the graphics. Each of the products is reflected to stay in the theme " to make jealous the women ", that that is with regard to the picture as well as to the style of the garment. On our products, we practise the screenprinting *, we pass by a Parisian company to realize them. Our T-shirts are cotton 100 % and our sweatshirts are cotton 50 % and 50 % in polyester. The polyester is a material which returns the more elastic and lighter textile. · Do you Make by-products? At present, we have no by-products, but we have quite a lot of ideas on that. We would like to make a figurine of the bear, via a 3D printer, which is in the promotional video of the sweatshirt " The bear ". We want to develop, and we develop, several activities of art of street (skateboard, street art, dance hip-hop, rap). We sponsor a team of skateboard known on Niort which is called NOPE skateboarding, thus we have already thought of creating a board of skateboard Edyne. We have a command of stickers which arrives and we would like to create several, because that remains a shape of art, as the street art, because people can monopolize easily. · In a few words, tell us why a garment EDYNE Clothing would be the ideal present for Christmas? Edyne can please the children as the parents (my father wears Edyne!) 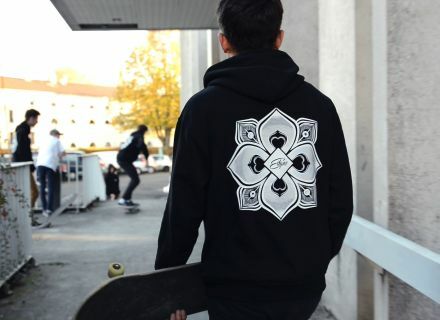 and because it begins to be cold, a sweatshirt Edyne it is the ideal present for this winter! · Where to place order? Directly at Rockslide, the shop skateboard of Niort. And soon on Poitiers, La Rochelle, Nantes and Bordeaux! · If you had to choose 3 words to define of Edyne Clothing, whom you would choose? Graph / urban / audacious. *Sérigraphie: process of impression by means of a screen established by a frame on which is tightened a fabric at stitches allowing the impression on multiple surfaces.